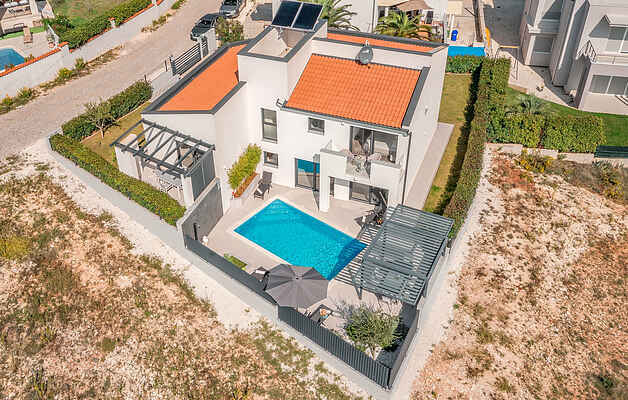 In the famous tourist town of Medulin, near the sea, you will find this beautiful semi-detached holiday home with an attractive and modern design. It is furnished with high-quality, stylish furniture and meets the highest requirements of modern tourism. Here you will surely enjoy the beautiful panoramic views of the sea and also the sunsets. On the ground floor is also a separate corner set up for the entertainment of your youngest. Relaxation and refreshment on hot summer days is offered by the pool. About 700 m of the road that leads to the house, are not asphalted.